Helen Breil is a friend and we lunch occasionally. I was intrigued when she first told me she was working on her second polymer clay class several months ago. I had previously featured her awesome magnetic polymer clay jewelry online class before so I knew she would have something innovative up her sleeve. Helen was surprised and said, "I didn't think you would be interested in bowls." Ah, but she was wrong about that. I was and am interested in bowls and I am sure many readers would be. We all could learn a great deal from Helen about shapes, textures and colors for polymer clay work. If not for home decor, then for jewelry making. I am not saying that just because she is a friend. She really is inspirational! There are 3 bowl designs in her Mad About Bowls class (the class preview is free - you do have to sign up on Thinkific first, also free). Helen chose 3 basic shapes to work with - square, rectangular and triangular. All of them, particularly the first bowl design, look Japanese in style. They all have the distinctive bowl shape made that way with clever cuts and forming. The triangular one is particular ingenious. It loses none of its texturing in the shaping process. The 90 minute class not only covers the bowl construction and coloration techniques also includes the templates, exhaustive downloadable lists for materials and techniques - even instructions on how to use the video format (pretty easy - I didn't have any problems). Helen, if anything, is meticulous. Helen actually uses different polymer clay brands and covers briefly their relative merits in her materials list. She is a fan of Kato clay which she recommends for the main bowls as the resulting projects are harder compared to other brands. But it is apparently stiffer to work with. It is helpful tips like this as well as those on how to maintain the shapes during curing which makes her class so useful. You can indeed use her class to make small decorative bowls - jewelry storage dishes, perhaps? But scaling them down would make some awesome 3D brooches and pendants too! I also liked her idea of using the bowls as wall decor! Her classes are not complete without her many inspirations. She goes over how she achieves the textures and colors for each one. Shown here are some of my favorites from her inspirational galleries. 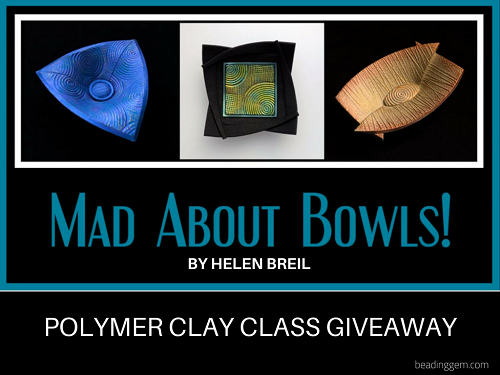 If you'd like to win this giveaway for Helen's Mad About Bowls class please make a comment below. Make sure you leave contact info below if you do not have an online shop or blog. It ends in a week's time at 6 pm EST Monday, May 28, 2018. I will pick the winner randomly and announce the results as soon as possible after. So be sure to leave a contact email if you don't have an online link or make sure you come back and check! Otherwise I will redraw in a week. Good luck! Helen Breil designs are so wonderful and these bowl creations are no exception! I would so love the chance to win this tutorial! Thanks! Such amazing bowls, I would love to do this project! I have other Helen Breil tutorials - they are so clear, inspiring and helpful. I'd really like to win this one. wow would love to win, I need some new inspiration. I have the magnetic pendant classes which is absolutely fabulous. Would love to have the bowl class as a matching pair! Wow! These are amazing! I would love to learn how to make these. I'd very much like to try these bowls ... beautiful work. Thanks for the opportunity! Wow! I would love to win this. Her work is amazing. I am a newsletter subscriber and will definitely share this too. Thanks to both you and Helen. I have always been fascinated with Helen's works. I would love the opportunity to attempt her tutorials! Thank you! Fabulous bowls! So unique. Thanks for the chance to win! Helen Breil is an an amazing shining star in the polymer clay world. Excellent tutorials, and so much free, ACCURATE advice too! And I charming lady, I was lucky enough to meet in person. I, too, would love to win this tutorial. And if I don't I'll just have to buy it. Thanks for the opportunity to win! These look fantastic and I would love to win this. I can see the care and effort that has gone into creating these bowls. It would be an exciting and informative experience to learn how to make these. I loved your so thorough explanation and review of this tutorial... I have been tempted for quite a while and knowing Helen’s work It would be amazing to have a chance to win it. Always love your textures. Lover your shapes. I can see these bowls as tiny bronze trinkets. The fact that you could see pendants and pins in Helen's bowls made me laugh Pearl. I think that you can find inspiration in everything you look at and turn it into jewelry somehow. My brother is a potter. Creating bowls like these and then glazing them with such patterns and colours would take and extraordinary amount of time and patience. The benefits of all the colours of polymer clay and how easy it is to fire speaks volumes when you look at Helen's work. The possibilities are limitless. Helen is an amazing PC artist and I would love to learn more of her secrets. Blog follower: zoowatcher10@yahoo.com. Thank you Pearl. These are so neat!!! I’d love to win this! Love these. I can see them modified to create brooches also. Helen's designs are so very distinctive. Please enter my name into the Mad about Bowls giveaway. It would be fantastic to have this as bowls are a favorite thing to make. I would love to win this tutorial -great work ! My email is: gabis20@hotmail.com. thank you !